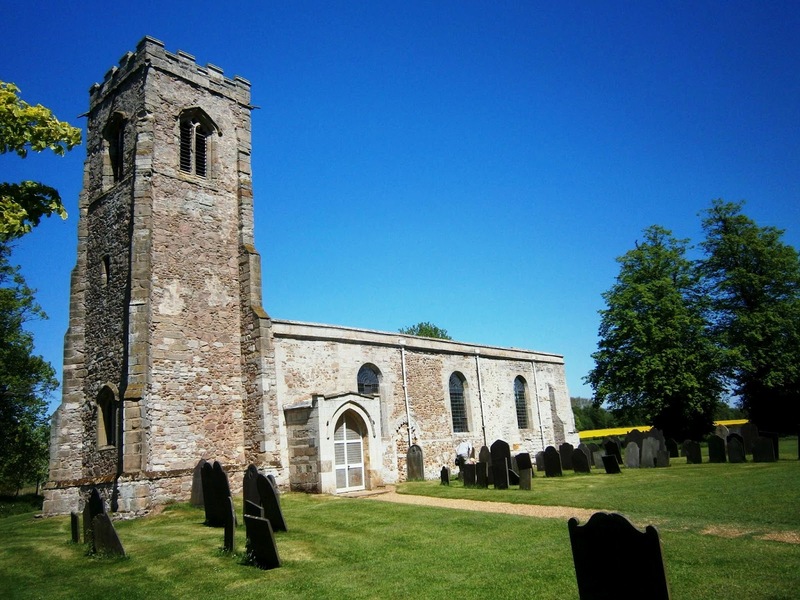 Newton Harcourt church (like the Manor House opposite - once the home of the Leicestershire architect Joseph Goddard) is separated from the rest of the village by the railway and canal. The attractive tower and west end stand right beside the lane, though the rest of the church was rebuilt in undistinguished 19th-century red-brick Gothic. It is easy to mourn this, but the Victoria County History makes it clear that if the Victorians had not taken radical action the church would not be here for us to enjoy today. And I suspect that is true of thousands of churches across the country. Tax relief on charitable donations: A welcome U-turn? George Osborne's decision in his recent Budget to limit the tax relief available on charitable giving appears to have been inspired by Nick Clegg's idea of a 'tycoon tax'. And that idea was strictly back-of-an-envelope and helped take the idea of a mansion tax off the political agenda just as the some of the more thoughtful Tories were becoming willing to consider it. So in many ways I am happy to see the limit scrapped in the latest U-turn. Kudos to the Coalition for unequivocally defusing this row, rather than (as I’d feared would happen) attempting to finesse a compromise that would have been messy and satisfied no-one. The simple principle which I’ve consistently argued - that in a liberal ‘Big Society‘ individuals shouldn’t pay tax on money they voluntarily forego (sic) for charitable causes - is the one that’s been upheld. the row over the reduction of tax relief on charitable donations also reveals that the wealthy inhabit a different tax world from the rest of us. There is a scheme whereby people under the PAYE system can use it to make charitable donations. But if you or I announced to the authorities that we had decided to reduce what we pay in income tax and give it to charity instead, I think we would receive pretty short shrift from the authorities. A world in which we don't pay tax but all give to our favourite charitable causes has its attractions, but I don't suppose it would prove workable. There would be plenty of money for donkey sanctuaries and Well-Behaved Orphans, but less for learning disabilities or the criminal justice system. So we have to pay our taxes. And if we have to pay our taxes, shouldn't we all be obliged to pay them before donating to our favourite causes? I am the last person to support the state over Stephen's 'liberal Big Society', but justice matters too. If philanthropy is a good thing - and it is - shouldn't we all have the chance to enjoy it? At present, as I suggested in the title of that earlier post, it is a case of tax avoidance for the rich and PAYE for the rest of us. It is notable that the town’s MP Harriett Baldwin kept her head down over Tesco. Her silence on the biggest issue to affect the town for many years was as shrewd as it was deafening. 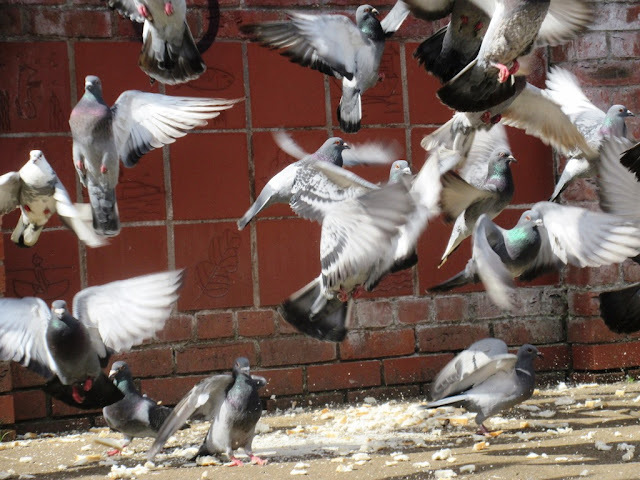 Rafael Behr hits a whole row of ducks in his latest New Statesman article. The Tories are perplexed. Most were convinced that Miliband’s leadership was a re-enactment of their experience under Iain Duncan Smith – a decent fellow, promoted beyond his powers. Conservative MPs watched with surprise and relief as Labour ignored the script and failed to mount a coup. Some were scornful of the opposition’s apparent lack of gumption. It has taken a while for the Tories to recognise that they even have an adversary. George Osborne’s reputation as a political mastermind has been shredded. He is defended by a phalanx of protégé MPs from the 2010 intake but older hands complain about his dual role as Chancellor and party election strategist, muttering that neither can be done well on a part-time basis. the Deputy Prime Minister’s office at 70 Whitehall has emerged as an effective power base for Nick Clegg. Even some Tories grudgingly concede that the Lib Dem leader has the more functional team. An on­going source of irritation for Conservatives is that advisers who report to Clegg sit in N0 10, while Cameron has no equivalent agents at the heart of the Lib Dem wing at Whitehall. The imbalance feeds the Tories’ suspicion that their coalition partners feign unity, then sneak around corners to plot subterfuge. The original idea was to share kudos with Osborne for having fixed the nation’s finances in time for an election in 2015. That could quickly become a rush to exchange blame for making things worse. Labour is praying for just such a collapse in its opponents’ discipline. The only thing wrong with it is the attempt at an extended tennis metaphor. Ducks are better. Coincidentally, a fire engine was also seen rushing through the town at the same time – it was attending some burnt toast at a Harborough residential home. On Saturday morning I visited Great Glen, the home of Engelbert Humperdinck. He was not there, being busy in Baku at the time. I have seen the end of the village's old High Street from the bus many times, but had never got off to explore it before. It is the sort of street that ought to have a little pub and it was pleased to find that it did: The Royal Oak. At the far end of the street I came across the house pictured above. Having come across the Liberal MP Thomas Tertius Paget at Laughton the other week, I wondered if CWP would turn out to be Charles William Packe, the Conservative MP for South Leicestershire. This guess turned out to be right. 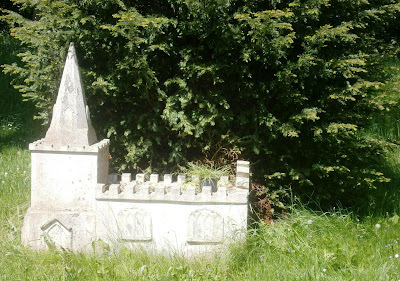 There were Packe graves in the village churchyard and the Victoria Country History confirms that he built the cottages. I wonder if there was a 19th-century trend of politicians displaying their initials in this way. Perhaps it served as a superior sort of garden poster, reminding people of your importance or beneficence, even between elections. Packe and his wife lie in a family mausoleum in Poole. Something to visit the next time the Lib Dems are in Bournemouth? Congratulations to Lib Dem blogger Mark Cole on becoming Chairman of Ceredigion County Council. Alex's Archives prepares to fight Iain Duncan Smith's reported intention to expand the government's mandatory work programme: "At the moment long-term unemployed people are likely to be out-competed for jobs by those who are recently unemployed and therefore job-ready. In a period of high unemployment beating unemployed people around the head with a stick may give some form of sadistic pleasure, but it is unlikely to do a great deal for either their self-worth or the unemployment statistics." Ceasefire is rightly outraged that Talha Ahsan, Babar Ahmad, Gary McKinnon, Richard O'Dwyer and other UK citizens are facing the real prospect of extradition to the US for alleged crimes committed in the UK for which most have been detained for years without charge or evidence. "Beleaguered Culture Minister Jeremy Hunt is in the midst of another 'omnishambles' which threatens to open David Cameron’s Government up to further accusations of cronyism and dodgy backstairs deals with lobbyists and Tory insiders," writes archaeology blogger Mortimer of the 'HMS Victory scandal'. Whirled Peas sat through the Eurovision Song Contest so you didn't have to. "So now I’m off to search eBay for some old editions of Enid Blyton tales — Dicks and Fannies and all." Free-Range Kids is against the bowdlerising of old children's books. The Shropshire Star, with commendable objectivity, rubbishes the idea that Ernest Maund of Craven Arms was one of the pioneers of British aviation. But this story reminds me that we really did have such a pioneer here in Leicestershire: Percy Pilcher. Percy Pilcher's life ended on September 30 1899, when he was 32, as the result of a rapid and unforeseen reduction in the distance between his homemade wooden glider, the Hawk, and the well-kept lawns of Stanford Hall in Leicestershire. Until that moment, the atmosphere among the moneyed gentlemen gathered to watch him must have been one of high anticipation: Pilcher's display, in what he called a "soaring machine", was the final fundraiser for a project so revolutionary that it promised to make him one of the most famous men of the coming century. For years, the race to design a motor-powered aeroplane had obsessed professionals and eccentrics across Europe and America; now Pilcher announced that he was days from completing one - all he needed was a bit of cash to fix its broken engine. But then, on his third flight at Stanford Hall, the Hawk "came down heavily", in the words of one aristocrat in the audience, the Honourable Adrian Verney-Cave, "with a crash that could be heard some hundreds of yards". Two days later, Pilcher died. Four years later, on December 17 1903, Orville and Wilbur Wright coaxed their own biplane jerkily upwards from a North Carolina field and into history. “I never had any illusions that there wouldn’t be a negative effect at least for the first couple of years, because the people who vote for us, if they didn’t vote for us, would vote for Labour, as they have a deep distrust of the Tories,” said Sir Alan. “Our job is to make sure the Government is a coalition and therefore that their fears don’t happen. “The other factor we have to contend with in the elections is that any Government in the situation that the country’s now in would be making very unpopular decisions. Sir Alan was also keen to talk about the dualling of the A1 - an issue which appears to be the Northumbrian equivalent of the Cornish pasty. Nowadays there is a rather sad game you can play when visiting a village for the first time: guess where the post office used to be. Newton Harcourt made it easy, having an Old Post Office in a Post Office Lane. Down that lane there was also a fine mid 19th century school perched above a railway cutting. In fact I have seen this building on my commute every day without realising what it was. 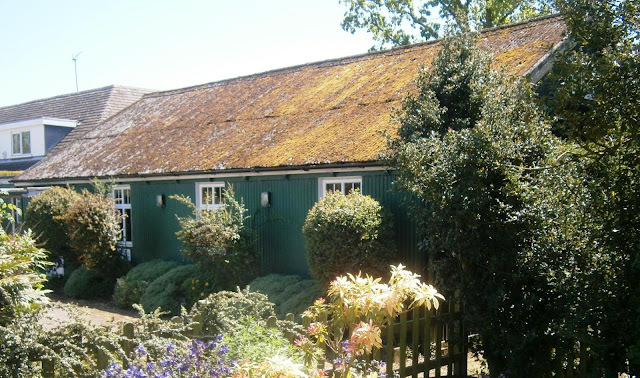 And Newton Harcourt Village Hall is one of those prefabricated corrugated-iron buildings I like so much. It has a brick extension at one end, but its essential nature is not in doubt. If the chapel from Mowsley Hospital can be dismantled and then re-erected miles away, maybe this hall was first used as a church somewhere else? Congratulations to the protesters who have persuaded Network Rail to suspend work on clearing trees from an embankment near Whitstable in Kent. As I discovered in 2003 when I researched and wrote an article for the Guardian about the clearance of the Wigston Triangle near Leicester, there is a good deal of local disquiet about the company's stewardship of the natural environment of railway land. Nature is very forgiving: in the years since I wrote that article the Wigston Triangle has largely regenerated. But as this video from N21.net shows, Network Rail's approach can be brutal. Sunday's Observer had an article purporting to show that the Liberal Democrats had been "sucked deeper into the controversy over News Corp's planned takeover of BSkyB". My first reaction was that I wan not aware we were involved in the controversy in the first place, so how could we been sucked in deeper? And Liberal Democrat Voice hurried to assure us that it was "desperately thin stuff". Certainly, the article failed to show that the two Lib Dem cabinet ministers it mentions - Vince Cable and Danny Alexander - had behaved with anything other than the utmost propriety over BSkyB. Nevertheless, the article does have a number of points of interest to party members. For instance, the emails submitted to the Leveson Inquiry by Frederic Michel (Murdoch's lobbyist) show that he attended what sounds very like a fundraising event for Nick Clegg's Lib Dem leadership campaign that we held while Menzies Campbell was still leader. Tim Colbourne, a Clegg aide, advised the News Corp lobbyist that he should try to get Labour to support the bid as this would convince Cable to back it. Quite why someone working for Nick Clegg thought it part of his role to advise News Corp on its tactics for winning over Vince Cable and the Department for Business, Innovation and Skills is nowhere explained. Michel was doing his job as a lobbyist, but it hard not to contrast the ease of access that such lobbyists have to government circles with the growing demands made of average citizens, Liberal Democrat members included, before they can have any access to them. The Liquidator is chosen as a tribute to the winners of the UEFA Champions League. It is a popular tune to play as football teams run out, and Wikipedia says that Chelsea, Wycombe Wanderers, Northampton Town West Bromwich Albion, Wolverhampton Wanderers and St. Johnstone all have claims to have been the first club to use it. "Way back in 1969, supporters of the Chelsea football team revered players such as Bonetti, Osgood and Hollins. The boys performed under the watchful eye of manager Dave Sexton to the tune of Harry J & All Stars chartbuster, 'The Liquidator'". Deborah Orr has a column in today's Guardian that reveals that she too was affected by the roof collapse in Stockwell. So that is a row of half a dozen houses that is home to Edward Garnier (MP for Harborough and Solicitor General), Will Self and Orr herself - a useful reminder of how our national life is dominated by London and the South East. Nor should we be surprised that the first Orr "knew of anything unusual was when my teenage son appeared, barefoot, in the local pub where I'd just met some friends". The fashionable parts of London are full of the barefoot children on Guardian columnists attempting to get their parents to come home. Unfortunately, this meant that six sets of residents were banned from entering their homes, even through the back, where there had never been danger of a stray half-brick coming down. Further, police officers were stationed on the street for 36 hours, protecting the houses from being entered by looters, or indeed us, to pick up a few essentials. Our children didn't have shoes. My neighbour's son sat his chemistry A-level the next day in his mother's slippers. I tried to explain to the police that the detachment of a single feature with no structural purpose was highly unlikely to have had much impact on the rest of the building's integrity, and that if only they'd let us back into our houses, they could go. But no. If something happened, the police said, they'd get the blame. The least helpful people of all, even less helpful than the media or the panicky, procedure-bound public services, have been the loss adjusters acting for our buildings insurers. Between us, we have paid 95 years' of premiums to protect against just such an unlikely occurrence as this one. But they have hired a forensic structural engineer, and evidence of blame against any or all of us is being diligently sought. It is clear from the excellent condition of all our homes that we cosset them. None of us noticed damp or cracks presaging this event because there were none to see. However, because our insurers wouldn't sign us off (and still haven't), we were unable to get scaffolding up when we would have liked to, so that we could stop the dangerous structure order, start using our homes again and free the police get on with more pressing duties. Further, if it rains before tarpaulin has been put over the open attic spaces, then the inside of the properties, and their contents, will become damaged, all because these men seek to manufacture some piece of sophistry that will let our insurers off the hook. So the incident painted an informative portrait of Britain in every way then. Two years ago I was at Wistanstow in Shropshire, one of the candidate sites for the martyrdom of St Wystan and the subsequent miraculous growth of golden hair from his first resting place (his remains were later taken to Repton in Derbyshire). 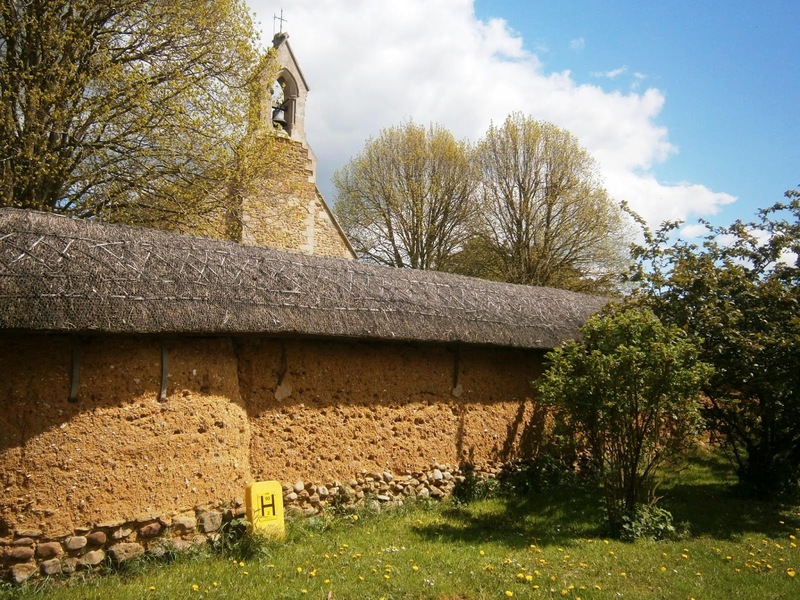 But Wistow in Leicestershire has the strongest claim to be the site - when the Church appointed a commission to investigate the claimed miracle, its members all came from the East Midlands - and that is where I was today. St Wistan's, Wistow, has Norman fabric but a pleasing Georgian interior, complete with box pews and plain glass. No burials have taken place in the churchyard since 1873 because of the risk of flooding from the neighbouring River Sence. And the grass had just been mown, so the lad would have got a short back and sides if he had tried any recent miracles. This British Pathe film from 1949 (click on the picture to view it) shows Sister Mary Ward who lived by the Grand Union at Stoke Bruerne and looked after the families who operated the commercial boats on the canal. One point of complaint: those boats were not barges, as the commentary repeatedly says, but narrow boats. When pointing out the shortcomings of the mayoral system of local government as implemented in Leicester - a Labour mayor and 52 Labour councillors out of 54 with those councillors being told how to vote by the mayor - I have been known to point to London as a better model. After all, at least the Greater London Authority is elected by proportional representation, ensuring that its assembly cannot be dominated by one party. There is ... no shadow mayor - and virtually no open press conferences .... And just as Boris had earned a reputation for treating committees in the House of Commons with contempt so did he frequently trade insults rather than information with the 25 London Assembly members elected to hold him to account. Anyone attending Mayor's Question Time at City Hall would not be wholly surprised to learn that Boris's favourite film is Dodgeball, with its running motto of "dodge, dip, duck, dive and dodge". Knowing that each member is limited to a six-minute slot in which to ask him questions, he filibusters, goes off on tangents, asks for the question to be repeated, answers a totally different question, constantly shouts over question, and employs each and every tactic to avoid answering, to the continual annoyance of successive assembly chairmen. And when that it not enough, he does what they do in Dodgeball and throws the ball right back at his opponents in the form of personal insults such as accusing Opposition members of needing "care in the community" of "suffering from Tourette's Syndrome" and patronising female members by addressing them as "my dear". You can blame Boris Johnson's personality and the fact that there are only 25 assembly members to represent a city the size of London. But at the heart of what is wrong here is the mayoral system itself. Enthusiasm for that system is a hangover from Blairite heyday, when supporters of debate and discussion just did not get it and Richard Branson was expected to become the first elected mayor of London. I am confident that, as so often, I speak for the nation when I wish Engelbert Humperdinck the best of good fortune in tomorrow's Eurovision Song Contest. 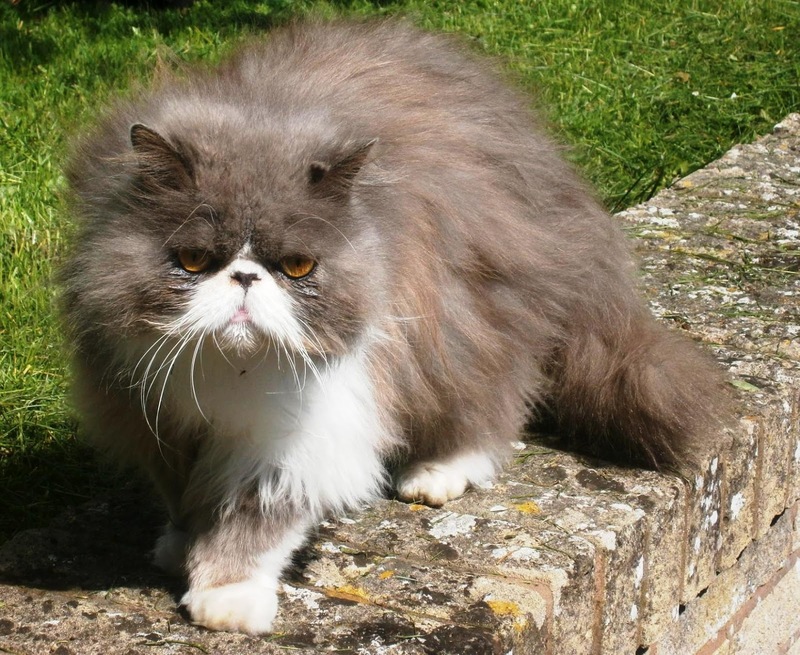 Mr Humperdinck, of course, is a long-term resident of Great Glen in the Harborough District. Indeed, he cut his musical teeth in our own Harborough Song Contest, which he has won many times. I know this event has its problems - the Langtons always vote for one another, Fleckney never fails to award nul points to Market Harborough - but I, for one, shall be glued to the screen when next it takes place. The Solicitor General Edward Garnier was among those evacuated after masonry, bricks and other debris fell into the properties and sent rubble flying onto the Stockwell street. MP Mr Garnier said his wife was inside at the time and feared a bomb had gone off. Thankfully Mr Garnier and his family escaped unhurt, but I do not know what surprises me more about this story: the news that the MP for Harborough lives in Stockwell or the discovery that he is a neighbour of Will Self. The pastoral care of pupils is very good. Parents really value this because they believe it really benefits their children's academic and personal development. 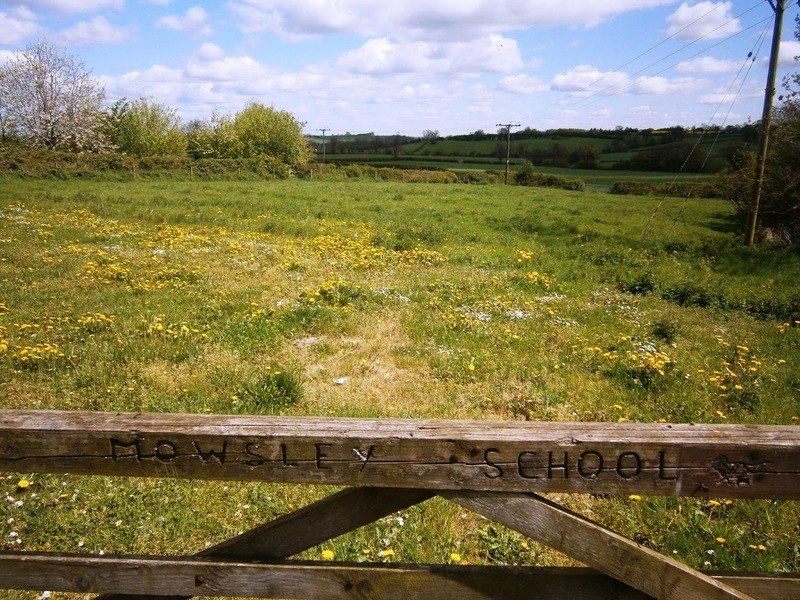 The comment made by one that 'Mowsley is a small school with a big heart' was supported by many others in writing to the inspector. While most schools are bustling with children back after the summer break, one has had to close its doors after no pupils turned up on the first day of term. Governors at Mowsley St Nicholas CE Primary School in Mowsley, near Lutterworth, Leicestershire, are now consulting on its future after watching its roll drop to nothing. Chair of Governors Kim Hall said: "At the moment it's still officially open but it's not got any pupils in so it's not actually open." She said a dropping roll had a "snowball" effect as more parents moved their children away from the dwindling numbers. "I think a lot of parents decided one child was moving on so they would move their other child," she said. "Once numbers dip below a certain point, and children's friends leave, their parents think they'll move them to be with their friends. I have heard of this sort of effect elsewhere in the country. Many middle-class parents are happy to sure the state system while their children are of primary age, even if they have ambitions to educate them privately when they are older. But once a few families decide to take children out of a village primary and send them to private school in the nearest town or city, then the writing can be on the wall. More families will follow suit and a school can soon find itself left with the poor and immobile. And when a school is as small as Mowsley, it can close altogether. 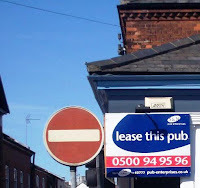 Mowsley still has a pub, even if it is now devoted more to food than beer. But there are no shops and the two chapels have long since become private houses, leaving the church, as in so many other villages, as almost the only public building. 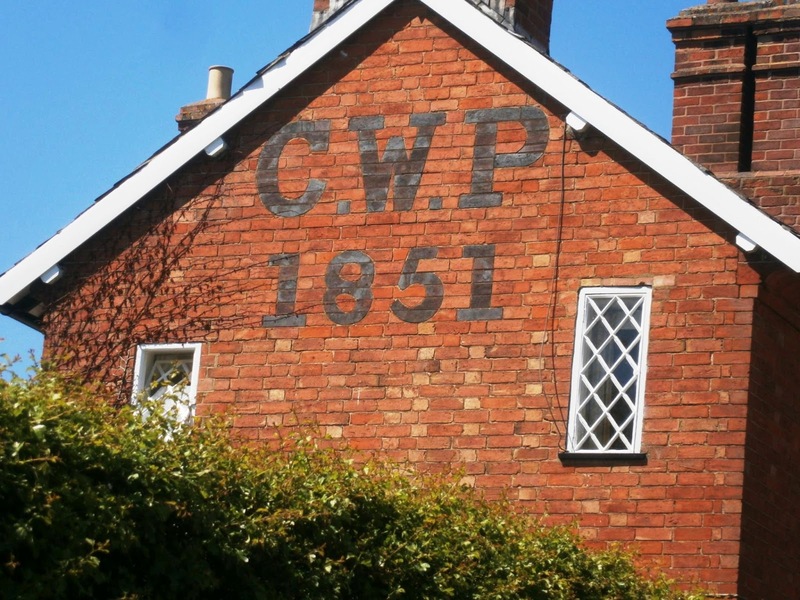 The school used to be housed in a tiny red-brick building near the church, with the older children enjoying the doubtful privilege of being taught in the village hall. But somehow this gate into what used to be the school playing field, some way from the school building, was more moving. Mr Reggie Chapman, eighty-seven, said it was the quiet, which in his old age had settled on the village like snow. Poets burble about a lost peace, but not countrymen. 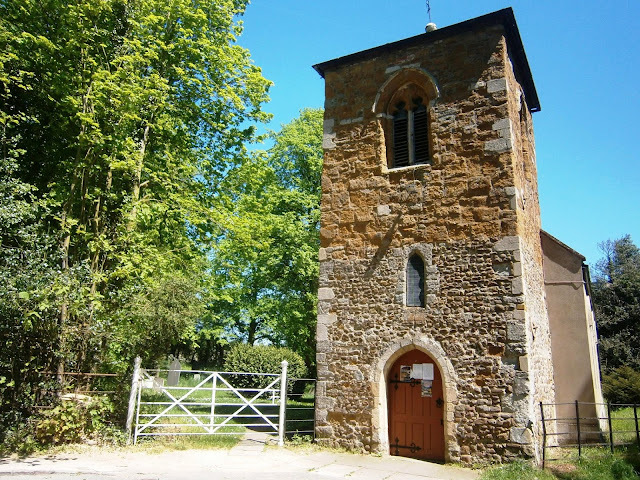 Mr Chapman, a silvery, whispering gentleman, very bent ("like Nebuchadnezzar, I am almost down to the grass"), remembers the hullabaloo of his youth in Abthorpe, near Towcester: the church bells, the school bell, the sound of children playing and cows being driven back into the village at night. He has seen them all go. Austerity and growth, of course, are not opposites. We need a good dose of both. But, with European opinion moving against the former and in favour of the latter, Oxfam has chosen a good moment to publish this short book written by eleven eminent economists and social scientists. You can download Be Outraged: Austerity isn't working as a PDF from the Oxfam website. So, before we forget altogether, let's pause a moment to remember some of the good things about austerity and bad things about growth. In the early days of the environmental movement it was widely believed that there were environmental limits to economic growth - that belief was practically what defined the environmental movement in the face of post-war social democracy. The idea that we would one day run out of vital resources was always a little fanciful, but we have seen in oil that the need for new discoveries has led to more hazardous operations - think of the Gulf of Mexico, the North Sea, Canadian oil sands - and more environmental damage. I know that both sides have agreed to call for 'green growth', but the lack of argument here feels more like wishful thinking than a conceptual breakthrough. Those who oppose austerity want to see more public spending and want to see it financed, not by higher taxation, but by borrowing. But it has always seemed odd to me that the left are so set upon a policy that puts the country in thrall to the people they despise most: international financiers. I suppose it flows from putting ever-growing levels of public services at the centre of your politics and then lacking the courage to raise the taxes to pay for them. John Maynard Keynes famously pointed out the dangers of treating national debt like household debt. Robert Skidelsky, Keynes biographer, has summarised the reasons why this is so: governments, unlike private individuals, do not have to “repay” their debt: they have their own Central Bank and their own currency and they can continue to borrow. But national debt still has to be serviced: we have to pay interest on it. So with the current UK national debt being somewhere in the region of £1.046 - I make that a 13-digit number - there are good arguments for trying to keep that interest down. And the rate is determined by the markets set by our old friends the international financiers. So that is the case against growth - or at least in favour of austerity. And perhaps it is because of it that I find the best two chapters in Be Outraged to be those that have least to do with the austerity vs growth debate. The richest 1% (61 million individuals) had the same amount of income as the poorest 3.5 billion (56% of the world’s population). At the bottom end, two in five of the world’s population, live below the international poverty line of US$2 a day; of those, one billion people live in extreme poverty, surviving on less than $1.25 a day. When the financial sector has been well regulated and controlled, and when well-run public banks have played an important role, the financial sector has played a positive role to support and not undermine the real economy. Examples are post WWII USA and Europe, and many developing countries (like Brazil and India) then and today. The positive experience is clear for public institutions in Europe, such as the European Investment Bank (EIB) at a regional level, and German KfW (Kreditanstalt für Wiederaufbau) at a national level, and in developing countries, such as the BNDES (Banco Nacional de Desenvolvimento Econômico e Social) in Brazil. All good stuff, but it was just as valid five years ago when the economy was booming. But then one of the weaknesses of Keynesian economics is that people love the idea of stimulus when things are going badly but are deaf to calls for restraint when the economy is booming. But Be Outraged, which was inspired by Indignez-vous, a multi-million best-seller written by Stephane Hessel, former member of the French resistance, will interest anyone looking for ways out of our current morass. So why not download a copy for yourself? On Sunday I blogged about The Lady: A Homage to Sandy Denny - a tour currently crossing the country. I did feel though that the evening was weirdly stop-start, and a lot of the enjoyment depended on sympathy or otherwise with the person who happened to be singing at the time. I thought Green Gartside’s highly distinctive voice just about got through The North Star Grassman and the Ravens, but he murdered Nothing More. I don’t think there’s anything he could have done differently, and it’s a shame because between songs he came across as possibly the most genuine fan, but it just wasn’t for me. All that and he calls me "estimable" too. Vince Cable: "The moral centre of gravity for the Coalition"
He has not just acted by the letter, but in the full spirit of this reforming Government, quietly privatising the Royal Mail, standing out against new regulation in the workplace, and becoming a powerful advocate of Oliver Letwin’s “red tape challenge”. Mr Cable deserves the bulk of the praise for the recent small surge of inward investment into Britain, though characteristically he has not tried to grab all the credit. Mr Cable is right and Mr Beecroft, along with his Conservative admirers, has taken a very dangerous wrong turning. The kind of untrammelled free market capitalism which Mr Beecroft is advocating is inhumane, unedifying and unBritish, and ultimately comes close to the false proposition that the Conservative Party should be the plaything of very rich men pursuing their financial interests at the expense of a disempowered workforce. It sounds paradoxical to say so, but Mr Cable is a new type of politician. He has knocked about the world, working as an adviser to the Kenyan government and chief economist of Shell ... Alone among the Liberal Democrat members of the front bench, Mr Cable has managed to stay loyal to the Coalition without surrendering his identity. Mr Cable is now in that very interesting place: he is the moral centre of gravity for the Coalition and of British public life. If Nick Clegg, as widely expected, steps down as Lib Dem leader before the general election, Mr Cable – should he decide to run – is highly likely to replace him. His best years may lie ahead. Vince Cable was right to dismiss Adrian Beecroft's proposals to make it easier to sack people, argues Issan Ghazni. Guy Rundle in the Melbourne newspaper The Age looks at surveillance and the London Olympics: "Two years ago, the London Olympic Committee to smiles all round, unveiled the 2012 Games official mascots, Wenlock and Mandeville - cartoonish aliens, each with one eye in the middle of the head. The committee couldn't have been more chuffed, but pride turned to dismay once the public had a chance to react, pointing out en masse that the duo did indeed symbolise London, but only because the creature resembled the city's most ubiquitous presence, the street CCTV, the beige, rectangular cameras bolted to every street corner, every wall." Sarah Goodyear on Atlantic Cities says road traffic is the single biggest source of fatality for young people worldwide. Rethinking Childhood sounds a happier note: "Last week I visited a school where the students can build dens freely, any time they want, during breaks between lessons. In case you were wondering, Berwick Fields Primary School in City of Casey, Victoria, Australia is not a Steiner School, or a progressive private institution. It is a state school (and a large one, with over 1,000 students on roll)." Urania Cottage, Charles Dickens' home for 'fallen women', is discussed by Revisiting Dickens. The Widow's World is entertained by The Ukulele Orchestra of Great Britain and its unique take on Kate Bush's Wuthering Heights. Roman remains discovered at the controversial Windy Ridge site in Harborough include pieces of pottery and the remains of a small farm or settlement, archaeologists have revealed. 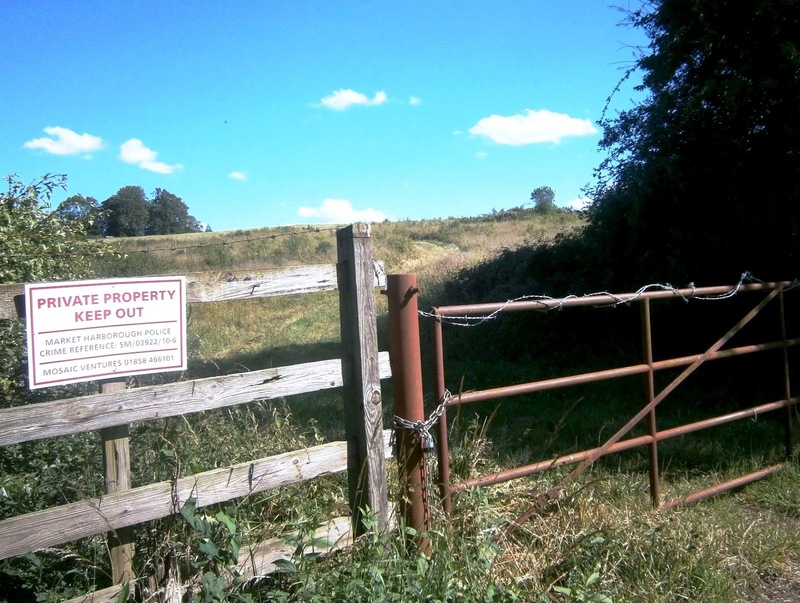 he archaeologists, who began their work in March, will now submit a report to the council, which will take the find into consideration when deciding whether to grant planning permission. 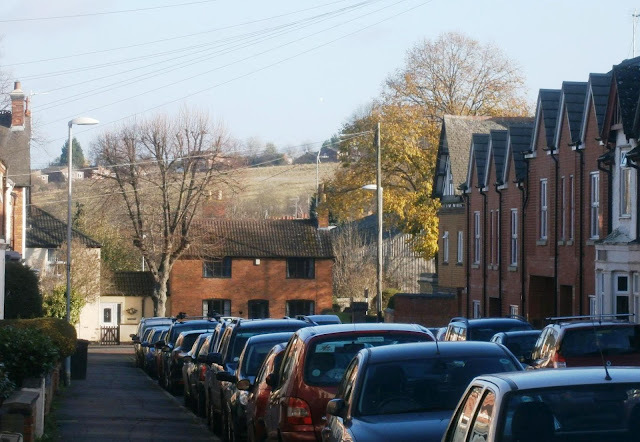 The photograph, taken from a distance, shows how the site can be seen from across the town. In July 2010 I blogged about Leicestershire County Council's attempts to save money by turning out street lights at night. Shropshire Council approved proposals to convert 70 per cent of its streetlights to ‘part-night lighting’ in September 2011, meaning they are lit until midnight and then switch themselves off until 5.30am. Work is due to start on the first lights in the programme in mid-June. The Shropshire website talks about kilowatt-hours of power and tonnes of carbon, but does not say how much money is being saved. In Leicestershire, remarkably, it was claimed that turning off night-time lighting in seven villages and along 50 rural roads would save "up to £700,000 a year". In that original post I supported the move partly on the grounds that it would reacquaint us with the glories of the night sky. But there may be less starry-eyed arguments for it too. Moves to give companies sweeping powers to dismiss under-performing employees are set to be abandoned by David Cameron following a bitter Coalition split over the issue. The Prime Minister risks a new row with the Conservative right by accepting that plans to allow employers to "fire at will" cannot be forced through in the face of Liberal Democrat resistance. Conservative Cabinet ministers are arguing for the Government to take an axe to employment law which they argue is helping to choke off economic growth and job creation. A report commissioned by Downing Street by the venture capitalist – and Tory donor – Adrian Beecroft recommended allowing companies to sack staff whose performance it considered to be poor. But the proposals have run into entrenched opposition from Vince Cable, the Business Secretary, and fellow Liberal Democrat ministers. Vince Cable, of course is right. I would not be against very small business being allowed more exemptions from employment law - yesterday evening's Newsnight suggested that a deal had been done over moves in this direction. And I would not be against the Lib Dems being associated with such a move. We badly to re-establish in the public mind the notion that Liberals are on the side of the individual and small businesses. And I do suspect that the law can make unrealistic demands of such businesses. More making workers feel less secure will do nothing to restore economic confidence, which is one of our great needs at the moment. The irony is that Vince Cable is doing David Cameron a great favour. The last thing Cameron needs to do at present is convince more voters that he cares nothing for their lives or interests because he is on the side on the wealthy. It was suggested at the time the Coalition was established that Cameron was a master strategist. He had recognised that the Tories great weakness was the demise of their moderate wing and had recruited the Liberal Democrats to act as its replacement. After a couple of years of Cameron as prime minister we are more inclined to believe that any master strokes he comes up with are inadvertent, but I still think there was something in this. If I go Liberal Democrat Conference these days it is to help out with the party newspaper rather than as a voting representative. So in a way the announcement that the Lib Dems are to continue to insist on police accreditation of representatives does not affect me. But it has still saddened me. It appears we now live in a country where you need police permission to attend political conferences. I grew up in a country where we congratulated ourselves precisely because we did not live like that. This was seen both as a way of showing we were not like the Soviet Union and as our reward for having defeated Hitler. If you can hear ghostly laughter, it is probably Osama Bin Laden. is to be kept in sight, inspected, spied upon, directed, law-driven, numbered, enrolled, indoctrinated, preached at, controlled, estimated, valued, censured, commanded, by creatures who have neither the right, nor the wisdom, nor the virtue to do so. More and more that describes the experience of being a political activist in modern Britain. And if you do use the party's democratic structures to challenge something, as Lib Dem members did with police accreditation last year, then you will ignored. However, whilst some of us are willing to risk the possibility of serious harm to ourselves by not following police recommendations to accept accreditation for all conference goers, we accept that we do not have the right to impose this on others who have no choice about attending Conference. This includes the many staff that will be working for the venue, the Conference hotel or for the Party. So not only are our arguments ignored: we have to suffer the clear implication that we hold our view only because we do not care about the workers. If activists are treated like this, and also face security precautions that make attending conference the equivalent of taking a transatlantic flight, many will drift away from the political process. It is no wonder that so many people are choosing to be active in charities and single-issue pressure groups rather than political parties. If nothing else, you are more likely to be treated with respect. Today York City beat Luton Town in the Blue Square Bet Premier play-off final to return to the Football League. And, according to several people on Twitter, Vince Cable was there to see them do it. Like many little boys of my generation I learned sports skills in the street and the local park. I was introduced early to the excitements of heaving crowds on the terraces, the crescendos of noise and fierce loyalty to the local football club – York City, then a good side which I followed to a cup semi-final against Jackie Milburn’s Newcastle. Now they are, rather sadly, low down in the Conference league. And I learned hero-worship of stars (mine was a rather plump part-time milkman called Arthur Bottom who scored numerous improbable goals). Arthur Bottom died last month and you can read more about him in this article from The Press. But today there is a sickness of greed and inflated values, like that which preceded the financial crash. A Chelsea fan hurriedly interjects: That's quite enough of that. The Lady: A Homage to Sandy Denny, a tour commemorating her songwriting legacy, began in Liverpool last night. In the years since her death, Sandy has emerged as one of the UK 's greatest singer-songwriters. This is slightly clumsy, and I wonder if it is even true. While the songs of Nick Drake, who was once the acme of undeserved obscurity, are heard so often as backing music on BBC programmes that you are tempted to groan, Denny remains something of a cult figure. This special tour celebrates her legacy for a new generation and showcases for the first time her entire songbook taking in her work with Fairport Convention, Fotheringay, her solo career and the new songs completed by Thea Gilmore on her acclaimed album ‘Don’t Stop Singing’. Sandy Denny has featured here twice before. Solo was the second Sunday music video I ever chose and two years ago I picked Bushes and Briars. 'Fotheringay' deals with the imprisonment and execution of Mary Queen of Scots at the Northamptonshire village of the same name. It is a place I have long wanted to visit: the castle where she was held has long since vanished, but the church looks spectacular. This track also gave its name to the band that Denny formed with her husband Trevor Lucas. I have chosen a demo of 'Fotheringay' by Sandy Denny alone, but I do like the instrumental arrangement on the finished version too. My old New Statesman columns have disappeared down the memory hole and are no longer to be found on the magazine's website. The practice of parading the torch around the world dates all the way back to 2004. 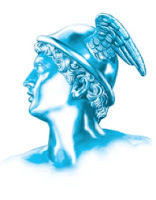 But it’s true the idea of carrying the flame from Olympus to the venue has a longer pedigree. Like most Olympic traditions, it was invented for the Berlin Games of 1936. Albert Speer was in charge of the pageantry there, and he decided to repeat the 'cathedral of light' effect that had gone down so well at the Nuremberg rallies. First things first: Stephen Tall on Liberal Democrat Voice wins Expression of the Day for his 'thin homogeneity'. He was writing about an Independent diary story about Paddy Ashdown's criticism of politicians who have never had a job outside politics - which seems to be most of them these days. "The difference with politics today and politics when I was leader of the Liberal Democrats, is the people working in politics. "I worked in the military. I was involved in business. I have been unemployed twice, working as a voluntary youth worker for the council. Today's politicians have simply only ever been politicians." Chelsea triumph! Do you remember the first time? This is the first Chelsea trophy I can remember: beating Don Revie's Leeds United (AKA The Evil Empire) in the FA Cup final after a replay. This video shows the three goals from the replay. Note the sublime chip from Charlie Cooke (my hero in those days) and diving header from Peter Osgood that led to the first goal. And note the incredible throw in from Ian Hutchinson that led to David Webb's winner. Makes Rory Delap look at bit tame, doesn't he? It is sad to think that neither Osgood nor Hutchinson (nor Peter Houseman who scored in the 2-2 draw at Wembley) lived to see Chelsea become champions of Europe this evening. The University of Bath website has a podcast of a public lecture about Richard Jefferies by the photographer Roger Vlitos. More about Roger Vlitos on his own website. And more about Richard Jefferies (about whom I wrote my Masters dissertation) in a Liberal England guest post by Rebecca Welshman. The idea that Chelsea have no history has always been nonsense. They were in the FA Cup final during World War I, won the Championship in 1954-5 and won a European trophy before Liverpool did. But it is interesting in that it may represent a folk memory of the fact that Chelsea were formed in 1905 to fill the already-existing Stamford Bridge Stadium, where they have played ever since. 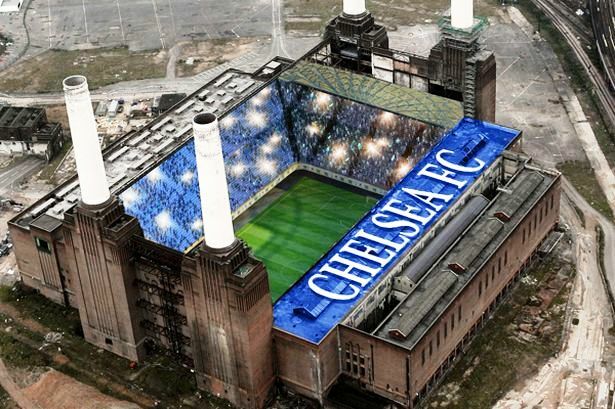 I ought to be appalled at the idea of Chelsea leaving the Bridge, but there is something wonderful about the thought of the club reviving the derelict and traduced Battersea Power Station. It looks particularly so in the illustration above (which comes from the SkyscraperCity board), though I suspect the proposal is to build the new stadium beside the power station rather than within it. It has a further appeal for me: I am a lifelong Chelsea supporter because my mother was born in Battersea. And I gather this is quite common among Chelsea fans. In the streets around Stamford Bridge people support Fulham, but the club's support follows the railway lines south out of London. Writing on Liberal Democrat Voice, Tim Farron invites you to send in your nominations for the Liberal Democrats' 2012 Party Awards. A Lanson Boy celebrates the way that Cornwall's Lib Dem MPs have united against the regional variation of public-sector pay. He quotes Stephen Gilbert from St Austell and Newquay: "Local pay threatens to institutionalise the structural problems in the Cornish economy where we have lower than national average wages but have higher than national average costs on housing, water and fuel. We need to work to close this gap and we will not do so by a rush to the bottom in public sector pay." The All Party Parliamentary Save the Pub Group has just celebrated its third anniversary, says Greg Mulholland (Lib Dem MP for Leeds North West). Did Michael Powell invent the 'Hitchcock climax'? US Intellectual History considers the relationship of the two great British film directors. Love and Garbage has the latest police bulletin on their hunt for Paul Gambaccini: "We urge you not to approach him, particularly if you have ever had any involvement in the music industry. In fact, it is best not to approach him if you have ever played any musical instrument (down to the humble maraca or triangle in a school band) or sang in public. If you see a television station that Mr Gambaccini is not on, or a radio station he has not appeared on, please contact us immediately. The likelihood is that he will be there in minutes and we can arrange for officers to be in attendance to try to bring this reign of pop terror to an end." I pass to an observation of the late Sir Karl Popper, who could himself be a tyrant in argument but who nonetheless recognised that argument was valuable, indeed essential, for its own sake. It is very seldom,as he noticed, that in debate any one of two evenly matched antagonists will succeed in actually convincing or “converting” the other. But it is equally seldom that in a properly conducted argument either antagonist will end upholding exactly the same position as that with which he began. Concessions, refinements and adjustments will occur, and each initial position will have undergone modification even if it remains ostensibly the 'same'. A large black labrador-sized animal was seen near Arthingworth. It was spotted from about 40 metres away through a low-powered telescope on Wednesday, May 2. The report, made to the Big Cats in Britain group, described the animal as black with white patches on the front. It was definitely not a dog, said the report. The incident is the latest in a series of sightings of ‘black beasts’ stalking the Harborough countryside which go back as far as the 1990s. These include sightings at Arthingworth, Kibworth, East Farndon and in Harborough. We blogged about a sighting of the Black Beast in Foxton at the start of the year. More, as ever, on Rutland & Leicestershire Panther Watch. Roman remains have been discovered at a site in Harborough which has been at the centre of a battle between developers and residents. The Mail understands archeologists have found remains at the so-called Windy Ridge site off Glebe Road in Little Bowden. County Hall, which is responsible for archeological finds, confirmed that Roman-era items have been unearthed but had no further details. It may have happened a long time ago in a galaxy far, far away, but Star Wars has come to Harborough after street-signs inspired by the blockbuster were put up around town. Signs warning ‘No X-Wings’, advising motorists to look out for Jawas crossing St Mary’s Road and pointing people in the direction of the cloud-city of Bespin and the spaceport Mos Eisley were placed around the town centre. 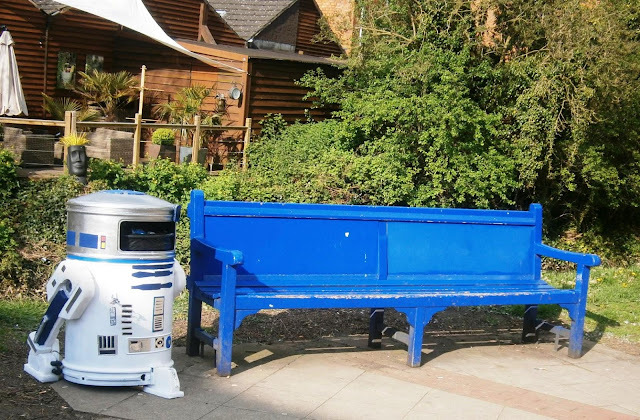 There was even an R2-D2 near Sainsbury’s in St Mary’s Place. More on the Reform Section 5 website. "Around the cabinet table, a majority, including myself, were privately educated," Gove said. He added that the shadow chancellor, shadow business secretary, shadow Olympics secretary, among others, were also educated at private schools. "On the bench of our supreme court, in the precincts of the bar, in our medical schools and university science faculties, at the helm of FTSE 100 companies and in the boardrooms of our banks, independent schools are – how can I best put this – handsomely represented," he said. Just 7% of the English population are educated privately, but half the UK's gold medallists at the last Olympics went to independent schools, Gove said. Quoting Luck, a book by Ed Smith, a former England cricket player turned journalist, Gove said Britons were 20 times more likely to play for England if they had attended a private school. While 25 years ago, only one of the 13 players representing England on a cricket tour of Pakistan went to a fee-paying school, that figure had risen to two-thirds. "The composition of the England rugby union team reveal the same trend," Gove said. The stars of British comedy, theatre and TV were predominantly from public schools, he said, citing Hugh Laurie, David Baddiel and Armando Iannucci. "Popular music is populated by public schoolboys," he said, giving Chris Martin of Coldplay and Tom Chaplin of Keane as examples. But the public school "stranglehold" was strongest in the British media, Gove argued. The chairman of the BBC and its director-general, as well as many national newspaper editors, were former private schoolboys, he said. I quote at such length only to show that Gove was right: Britain is dominated by the products of public schools. Though it is worth pointing out that Gove himself is not an exception to this trend, as is sometimes supposed, but an example of it. I once heard Andrew Neil, politely and forensically, force Gove to admit that his adoptive parents had paid for him to attend one of the most extensive private schools in Scotland. "Indeed, the Guardian has been edited by privately educated men for the last 60 years. But then, many of our most prominent contemporary radical and activist writers are also privately educated," he said. "George Monbiot of the Guardian was at Stowe, Seumas Milne of the Guardian was at Winchester and perhaps the most radical new voice of all – Laurie Penny of the Independent – was educated here at Brighton College. If he really believed in it, in the sense of being an adherent to the cause, he would implement a simple policy, which lies within his department's reach: shutting down private schools. Abolition has now entered the realms of party mythology. Labour no longer raises the private schools as an issue, let alone dabbles in solutions; its most recent statements on education have ignored the question entirely. The party's reticence is the more striking in that it has coincided with the expansion in the number of pupils at independent schools; left-wingers could legitimately argue that the greater the problem, the louder the leadership's silence. The abolition of private education would be both unethical and impractical: wrong on grounds of curtailing individual freedoms and of destroying many first-rate educational institutions; unworkable because the schools would have recourse to law. So great would be their determination to survive that in the meantime many would no doubt take up temporary residence in the disused castles of Normandy, cut-rate weekly return rates available for pupils, courtesy of the Channel Tunnel. Walden is surely right, which suggests that Monbiot is more concerned with looking good and justifying his anomalous position than with finding solutions to the greatest problem that British education - and, quite arguably British society - faces. David MacLean, the Leicester Mercury's excellent political correspondent, is leaving the paper for greater things. In a farewell post he writes: "A couple of years ago – while some editors were still so scared of the internet that they banned their reporters from blogging or using Twitter – senior Mercury staff were actively encouraging reporters to jump on board. It was my use of Twitter and this very blog that has made being political correspondent at the Mercury so rewarding." How would Keynes have solved the eurozone crisis? Writing in the Financial Times, Marcus Miller and Robert Skidelsky make some suggestions. "Record-low interest rates, a quiescent labour force and the (prospect of) a public spending squeeze has not boosted the private sector. British businesses' get up and go has got up and gone." Stumbling and Mumbling looks forward to the coming crisis of Conservatism. Norman Lamb MP welcomes the Groceries Code Adjudicator Bill on Liberal Democrat Voice. "The reason many people from these schools stay in touch with one another, and recruit younger students to their circles of acquaintances, is not because they harbour a dark desire to exclude the poor. It is because they gain pleasure and fulfilment from mixing with likeminded people who share their social and cultural outlook. The job opportunity side of it is a consequence of the network, not the reason for its creation." If state schools are to emulate the success of public schools in providing networking opportunities in later life, they must first understand the reasons for that success, argues Tom Finn-Kelcey on Spiked. In a City Living has some wonderful photographs documenting the rise and fall of Liverpool's tower blocks. It seems that it was Isabel who was the subject of the exchange in the House about prison conditions for suffragettes (your blog 10 July 2011). Isabel was arrested and imprisoned in June 1908. Nora was arrested on 21 November 1911, but there is no evidence for her going to prison apart from the notoriously unreliable 'Roll of Honour of Suffragette Prisoners 1905-1914', a list compiled in about 1950 based on the recollections of former suffragettes. Memes were all the rage in the early days of blogging, but they seem to have died out. Which is a shame, as they were one way new bloggers could tell us something about themselves and feel they were joining the club. So well done to Caron's Musings for starting a new meme - Five Years in Five Posts - looking at what she was writing at roughly this time of year over the last five years. 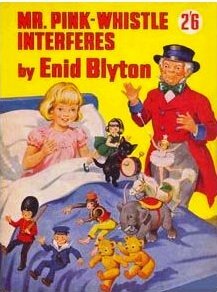 Already Jennie Rigg, a certain fluffy elephant and Nicholas Whyte have taken up the challenge. 15 May 2011. I celebrated 12-year-old Chris Whitehead's actions in going to school in a skirt to protest against not being allowed to wear shorts and took the opportunity to reproduce a few paragraphs from an essay on children's rights I wrote in 2006. 15 May 2010. I took readers to see the Clegg family pyramid in the Ukraine. 15 May 2009. In a House Points column for Liberal Democrat news I argued that Michael Martin was the worst Speaker in modern times. 15 May 2008. The leader of the Labour group on Sefton District Council won my Overblown Claim of the Week award. 15 May 2007. A short post sent you to information about the 11 people known to have been killed by earthquakes in Britain. 15 May 2006. In a post entitled "A lion has eaten our Oaten" I documented another stage in the decline of the then Lib Dem MP for Winchester. 15 May 2005. I pointed out how little Labour's banning of fox hunting had been raised on the doorstep during the recent general election campaign - even in Market Harborough. 16 May 2004. A news story about a Thameslink train driver who caused two terror alerts when he mistook a didgeridoo for a grenade launcher caught my attention. Thanks to Caron for the idea. I think it has caught this blog's concerns and eccentricities rather well. An inhabitant of Mowsley who appeared to have lunched well saw me looking at the map and urged me to take the gated road to Laughton. He was right. It was a pretty walk past the most ramshackle cricket ground I have seen, though I suspect that last time I came this way the road was not fenced and the passing places were not signposted. Laughton itself was lovely too. It can't be much more than five miles from Market Harborough and its train service to London, but it feels as remote as a village can. This blog is keen on mud walls, and the one around Laughton churchyard (shown above) is the best I have seen. 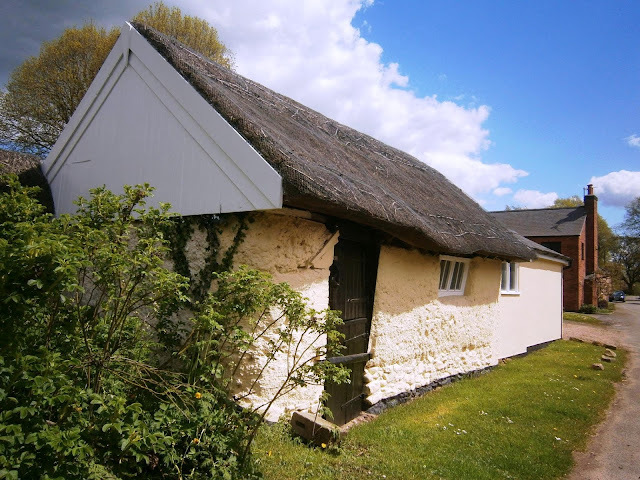 The Victoria County History from 1964 describes it as having slate capping, so the thatch must be a later replacement. It also says the mud-walled building that forms part of the wall (shown below) was formerly used as a slaughterhouse. 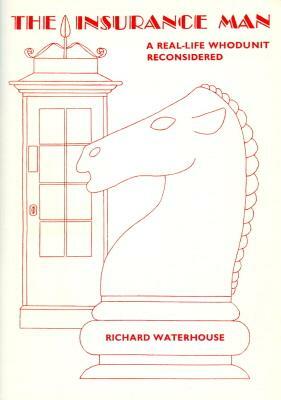 Wallace attended a meeting of the Liverpool Chess Club on the evening of Monday 19 January 1931, to play a scheduled chess game. While there he was handed a message, which had been received by telephone about 25 minutes before he arrived. It requested that he call at an address at 25 Menlove Gardens East, Liverpool, at 7.30pm the following evening to discuss insurance with a man who had given his name as 'R.M. Qualtrough'. The next night Wallace duly made his way by tramcar to the address in the south of the city at the time requested, only to discover that while there were Menlove Gardens North, South and West, there was no East. Wallace made inquiries in a nearby newsagents and also spoke to a policeman on his beat, but neither were able to help him in his search for the address or the mysterious Qualtrough. He also called at 25 Menlove Gardens West, and asked several other passers-by in the neighbourhood for directions, but to no avail. After searching the district for about 45 minutes he returned home. His next door neighbours, the Johnstons, who were going out for the evening, encountered Wallace in the alley, complaining that he could not gain entry to his home at either the front or the back. While they watched, Wallace tried the back door again, which now opened. Inside he found his wife Julia had been brutally beaten to death in their sitting room. The police had their doubts about Wallace, and convinced themselves that Wallace would have had time to commit the murder and still catch his tram to Menlove Gardens. He was charged murder, convicted and sentenced to hang. But the guilty verdict was quashed by the Court of Appeal on the grounds that it was ""not supported by the weight of the evidence". In other words, the jury had got it wrong. Wallace, by most accounts, was not much of a chess player, but this background was one of the factors that gave his case such prominence. Some must have suspected that he was some sort of criminal genius who had used his ability to plan to get away with murder. 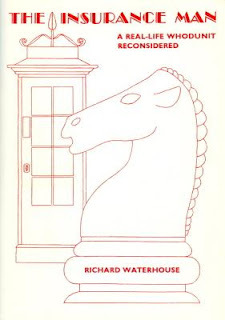 It is because of this chess background that the best survey of resources about the Wallace case I have come across is to be found on Edward Winter's Chess Notes site. I first came across the Wallace case through a Yorkshire TV 1975 drama-documentary. But my reason for writing about it tonight is the discovery that, before he joined the Pru, William Herbert Wallace had been the Liberal agent for Harrogate. He was appointed in 1911 but lost the job when party hostilities were suspended because of World War I.
Nick Clegg gave a major speech on education and social mobility at The New North Academy in Islington. You can read the full text on the Cabinet Office website. I find this an immensely encouraging speech. The danger was that, having succeeded in securing his cherished Pupil Premium, Nick would find himself defending it in the language of Labourism: ring fencing, benchmarking, rolling out a programme and so on. But today's he did away with that stultifying agenda altogether. While he used the terms ‘fair’, ‘fairness’ ‘social mobility’ and ‘socially mobile’ once each in his speech, the Deputy Prime Minister also used ‘freedom’ six times. ‘The coalition has no desire to micromanage schools,’ he said. ‘We all remember the worst excesses of that approach’. So the pupil premium cash won’t come with requirements on how it is spent: ‘Use it as you see fit’, Clegg tells schools. In short, it was a thoroughly Liberal speech, looking to local initiative and innovation rather than local control. Nick has also been widely quoted as rubbishing plans to bring in regional differences in public-sector pay - see the Guardian for an example. This pleases me for reasons I explained in a post on this blog in March. Finally, I cannot share Nick's enthusiasm for summer schools. If children are not being properly taught in primary schools then I am not convinced that a fortnight of extra schooling is going to put that right. The answer must lie in improving summer schools. I also fear that holding summer schools for poor children will be stigmatising and fail to tackle the problem that Nick is so determined to tackle: the segregation of education along class lines. As thinkers from Baden Powell to Lynne Featherstone have recognised, the progressive thing to do is to encourage the mixing of social classes. Nottingham Liberal Democrats are holding a dinner on Thursday 31 May with Vince Cable as their guest. Details and bookings via the East Midlands Liberal Democrats site. these 22-year-olds' love of vintage rock'n'soul, and the sort of Motown-influenced R&B the Stones and Spencer Davis were doing circa 1964/65, before things went all psychedelic and "weird". 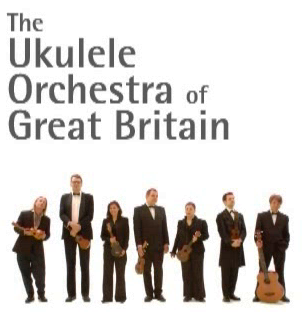 This, I thought, could be a band for me. The Quangos started their residency early 2011 and are fast building up a strong following and a solid reputation. Their sound is a great mixture of early Soul and Mersey Beat with a modern feel. Artists covered include Otis Redding, Sam Cooke, The Rolling Stones, The Spencer Davis Group, The Who and of course the Beatles. The Quangos also write and record their own original songs and use the opportunity to showcase a few of these during their Cavern shows to great response. Who has won my Boris Johnson finger puppet quiz? Win your very own Boris Johnson finger puppet!